term that refers to two concepts: the abstract unit of account in terms of which the value of goods, services, and obligations can be compared; and anything that is widely established as a means of payment. place where legal coinage is manufactured. The name is derived from the temple of Juno Moneta, Rome, where silver coins were made as early as 269 B.C. Mints existed earlier elsewhere, as in Lydia and in Greece; from there coinage was introduced into Italy. The first U.S.
..... Click the link for more information. " (1795) and "In God We Trust" (1864). Early coins were die-struck by hand and showed many individual variations. Standardized coins date from the use of a mill and screw machine (invented c.1561). Coins are usually stamped from rolled metal blanks, then milled. The final product bears a design impressed upon it between the upper and lower dies of a coining press. Milled or lettered edges have been used since the 17th cent. to discourage the removal of slivers of metal, especially from gold or silver coins. arrangement by which most nations of the European Union (EU) linked their currencies to prevent large fluctuations relative to one another. It was organized in 1979 to stabilize foreign exchange and counter inflation among members. ..... Click the link for more information. ). Canada introduced the first colored coin for circulation in 2004; it was a quarter featuring a poppy. 1.The corner of a building. 2. The stones or bricks which form the corner. 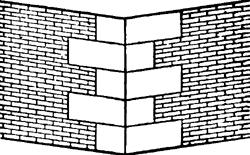 In masonry, a hard stone or brick used, with similar ones, to reinforce an external corner or edge of a wall or the like; often distinguished decoratively from adjacent masonry; may be imitated in non-load-bearing materials. Occasionally imitated, for decorative purposes, by wood that has been finished to look like masonry.